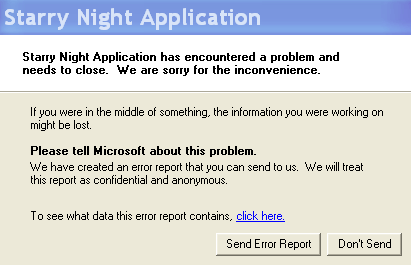 Error message: Starry Night encountered a problem and needs to close or stopped working (Windows) – Simulation Curriculum Corp. Realizing the best potential of your graphics card is often essential for achieving the functionality necessary for running Starry Night on your computer. The best potential of a graphics card is determined by the manufacturer of the graphics card. The manufacturer releases, and periodically updates, a software driver written specifically for your graphics card. Having the latest and greatest driver installed is often the solution to Starry Night start up failures. In this article we will explore a few paths that may be taken for finding and installing the latest and greatest driver for your graphics card. First, Windows operating systems come with a driver search feature. In Device Manager ---> Display Adapter <--- right click on the card listed and select "Update". While this method is the easiest, for some reason beyond my understanding, the most current driver that is, in fact, available is often not found by the detection software. For this reason I do not use, or rely, on this feature at all. Second, you can obtain a driver directly from the manufacturer of your computer. For example, if you bought a Dell computer, you go to Dell.com and follow the links to "support and drivers". The website UI is user friendly, helping to select your computer model, operating system and graphics card. After making a number of selections, a graphics card driver certified for your computer will be presented for download. One of the great features of these websites is the auto-detect service, whereby the website automatically detects your computer model, operating system, and driver to be installed. The website usually offers to take you through the installation process too. Third, you can obtain your driver directly from the manufacturer of your graphics card. For example, you may have purchased a Dell computer but the graphics card inside your computer was actually made by Intel. If that is the case, in many instances, you can go directly to Intel.com and look up the graphics card, specify an OS, and be presented with the latest driver written specifically for it. The driver you obtain from the graphics card manufacturer will always be the latest and greatest - sometimes even better than the one offered by the computer's manufacturer website. However, and continuing with the example, the driver found on the Intel website may not be *certified* for use with your Dell computer, and may not install as a result. An error message can appear which states "Drivers for this graphics card must be obtained from the computer manufacturer's website" or something to that extent. If that is the case, you can only use the certified driver available from the manufacturer's website. In Windows 7/Vista--->Start---> Control Panel---> System---> Device Manager---> Display adapters <--- what it says here will be the graphics card. In Windows XP-->Start-->Control panel-->System-->Hardware-->Device manager--> Display adapters <--- what it says here will be the graphics card. In WIdows 7/Vista ---> --->Start---> Control Panel---> System---> look under "Windows Edition" and "System" <---- what version of windows (Home, Ultimate, etc), and if 32 or 64 bit. In Windows XP-->Start-->All Programs--->Accessories-->System Tools---> System Information <---- what XP service pack you are running. Also what version of XP, and 32 or 64 bit. In WIndows 7/Vista ---> Start ---> In the Search Program and Files text window type "dxdiag" and hit return. ---> On the DirectX panel that opens up look under the System tab for "System Model" <--- what it says here will be the model. In WIndows XP ---> Start ---> Run --->Enter "dxdiag" in the text field and hit OK---> On the DirectX panel that opens up look under the System tab for "System Model" <--- what it says here will be the model. Armed with this information you can proceed to the relevant websites and search out your latest, greatest, driver!